I am quite sure that many of us who are in our early 30s and older would have had fond memories of heading off to the fun fair when we were little kids, and the ferris wheel was always one of the attractions which should not be missed. Of course, those with less intestinal fortitude would be happy with bumper cars, disturbing clowns who get around on stilts, as well as sitting in one of those spinning teacups. Well, here is a way for you to commemorate your childhood memories with the $129.95 Motorized Ferris Wheel Construction Set. 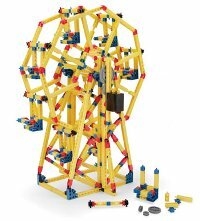 This particular construction kit will form a motorized, rotating Ferris wheel, and in total there are 890 parts so you know for sure this is not the toy to get for your hyperactive 5 year old. The 890 parts will comprise of plastic girders, connectors, and gears which require no glue as they snap together in order to form the 23″-tall Ferris wheel’s platform, frame, and eight swiveling passenger cars. The motor is battery-powered, where a quartet of spur gears will help rotate the wheel clockwise or counter clockwise at eight revolutions per minute, helping recreate the intricate mechanical design and leisurely pace which rolls back the years. It requires a couple of AA batteries to run, and comes with a color, step-by-step instruction manual to help the uninitiated.